The government’s recent consultation on rail fares reform potentially maps out significant changes. Anthony Smith, chief executive of Passenger Focus, offers his view on this. There is much to welcome in Rail Fares and Ticketing Review: Initial Consultation and the more general Command Paper it accompanied. It talked of a commitment to stop the seemingly endless round of above inflation fare rises and set out the need to make it much easier to buy tickets and improve the information surrounding ticketing. Much of the analysis is based on a string of work we have done in the last three years – all aimed at ensuring the passenger experience of fares and ticketing is well understood. The most immediate implication for passengers concerns the move towards greater management of demand – away from ‘predict and provide’ to ‘predict, manage and provide’. Making better use of capacity is a laudable aim. However, there are many within the rail industry who argue that the best way of achieving this is to move to ‘airline-style’ pricing models that allow (in theory) better utilisation of capacity. However, does this view, which makes sense in the cold rational economic light of day, really stand up when you consider how passengers use or want to use the railway? Or is it a refrain from the wealthy, hyper-mobile who can afford to buy and throw away Advance tickets? There are two key strands to the argument. First, that in the high-peak, capacity pressures can be ‘smoothed’ by a carrot-and-stick approach to pricing (lower shoulder-peak fares balanced by relatively higher peak fares). 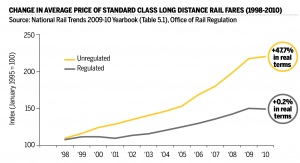 Second, that off-peak fares regulation distorts the longer-distance market (i.e. that the last peak train is empty and the first off-peak train is full). Many commuters have little (or limited) ability to change travel patterns in response to rising fares. Such decisions are often tied into longer-term choices on where to work or live. In such instances increasing fares for commuting will have little impact on demand and will not lead to changes in travelling behaviour. Put bluntly, if your ‘boss’ requires you to be at your desk by 08:30 or you have to drop the kids off at school, then you have little option but to pay. There is also a risk that this will disproportionately affect those on lower incomes who traditionally have least flexibility over start and finish times. McNulty’s rail value for money report looked at peak demand management. It found that it would take a 40% increase in fares over the course of five years to reduce peak demand by 5%! London and Manchester? They are different products with different expectations. In 2009, Passenger Focus published a major report on fares, Fares and Ticketing Study (2009), which showed that Great Britain benefited from some of the most frequent services in Europe. The benefits of this are lost if you are tied to a specific train. Turn-up-and-go frequencies do not align themselves well to airline-style, book-ahead restrictions. It is odd that we have what amounts to a bus-service frequency on many long-distance routes in Britain (e.g. three trains per hour London to Birmingham and London to Manchester), but the price of taking advantage of there being ‘another one along in a minute’ is very high. Our research among employers, Employers’ business travel needs from rail (2009), found that the high price of flexibility within the ticketing structure – for example, to allow for a meeting that overruns by 30 minutes – was a problem for businesses. Developing a way to give some flexibility at an affordable price is a key challenge. Not everyone is able, or wants, to plan their precise train journey weeks or days in advance. One of the attractions of rail is the ability to ‘turn-up-and-go’ – remove this and rail risks losing some of its value/utility. It is argued that the huge difference between fares for long-distance peak and off-peak travel creates a cliff-face that distorts travel behaviour – e.g. poor loadings on the last peak train while the first off-peak trains are packed. The argument continues that relaxing regulation on off-peak fares (i.e. the erstwhile ‘Saver’ fare) will allow train companies to implement a more graduated structure, similar to airlines, which will generate more revenue while promoting better network utilisation. However, this ignores the fact that the cliff-face is man-made. It is a consequence of train companies (outside the London commuter sector) being free to increase the cost of the unregulated peak single/return. The Office of Rail Regulation’s fares index (see graph) shows the increase in the average price of rail fares in real terms between 1995 and 2010. Long distance operators’ regulated standard-class fares (i.e. an Off-Peak ‘Saver’ return) went up by an average of 0.2% in real terms while unregulated fares (including peak Anytime fares) went up by 47.7% above inflation. Peak single/return fares on longer-distance journeys can now be so expensive that, by train companies own admission, relatively few tickets are sold. Why have peak trains with empty seats priced at levels only suitable for the high peak? If you want to fill up seats prior to the ‘cliff-edge’ why not consider lowering some of the peak-prices on the empty trains and generating new business and new customers? It does not always have to be a case of increasing the off-peak to the level of the peak. Passengers do not exist in a vacuum. They know that tough decisions are having to be made on budgets and, as taxpayers as well, want to see that their contribution is being spent wisely. They also know that high costs are passed back in the way of higher fares. But it is essential that arguments about demand pricing look at the ‘real-life’ impact as well as economic abstracts – sleepwalking towards a book ahead, single train only airline-style system has serious consequences for how passengers use the railway. So what is our solution? Move to try everything first to tempt passengers to quieter times before you start penalising them for daring to travel in the ‘peak’. Try extending the reservation window to make Advance tickets more useful. 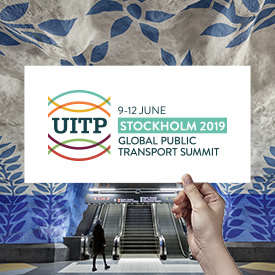 Develop ranges of products that reward or incentivise different patterns of travel – carnets loaded on to smartcards could really help large numbers of passengers make better-informed decisions. Really sell the advantages of off-peak flexible tickets – don’t hide behind ‘see restrictions’. The regulated off-peak price should be the advertised entry point – you can always get this fare. Trade up if you want to travel in the peak or, if you are willing to accept less flexibility and want better value for money, buy an Advance. Rail ticketing and developing a grown-up relationship with passengers is in its infancy – let’s develop that relationship before more draconian measures are imposed which, we think, passengers may resent.